Bleiben Sie mit uns in Santa Rosa Dunes # 952, ein Ein-Zimmer, eineinhalb Badezimmer Eigentumswohnung mit Blick auf Santa Rosa Sound und Pensacola Bay. Das Schlafzimmer verfügt über ein Kingsize mit eigenem Bad Bett, während auch ein Blick auf den Golf mit! Das Wohn- / Küchenbereich ist Beachy und hell, eine perfekte Atmosphäre für den Fang des Tages zu machen und mit vier Ihrer Gäste entspannen. Genießen Sie die Sonne am Strand oder fahren in die Stadt für einige große Attraktionen, Ihr Zuhause fern von zu Hause erwartet! Fine location. Needs updating inside and the patio furniture! Thank you for this review Adrienne! We are so happy to hear that you enjoyed your vacation to Santa Rosa Dunes #952! Hoping to see you again soon. My husband and I came to Pensacola Beach for a long weekend break. It was beautiful! We rented this unit at the last minute and we were very pleased. The unit faces the bay with a beautiful view. The beach was just across the street within walking distance. Absolutely gorgeous white sand and clear water...amazing! We walked to Peg Leg Petes for dinner, it was delicious and very reasonably priced. The condo itself is really nice. This is a 1BR unit. The bed is huge and very comfy. There is a bathroom off of the bedroom and there is a 1/2 bath in the hall way which is a nice addition for a 1BR. Everything you could need in the kitchen and the condo itself was very spacious and very clean. A great location! We loved it! Thank you for taking the time to write a detailed review! 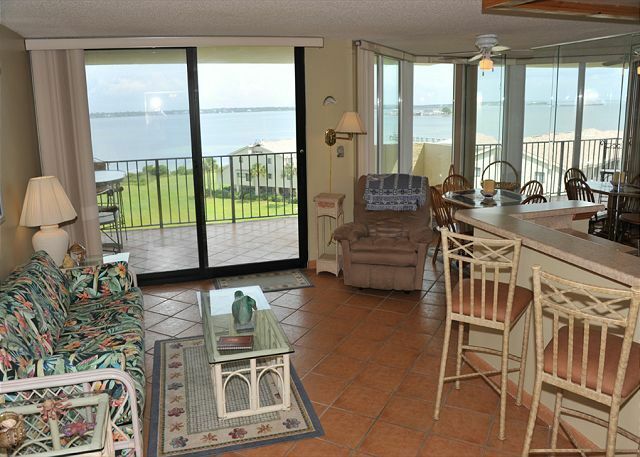 We love Peg Leg Pete's and are happy to hear that we were able to accommodate your last minute vacation to the beach! Great place, and awesome customer service. Will book again. Needs more comfortable chairs for the deck, an easier locking system, and a heads up for the pool fob. Was locked in the pool for a bit. Overall....an awesome stay. Well kept, and an awesome vacation. Loved it, and I miss it already. Thank you for your review! We will let management know about the suggestions you provided, and we thank you for letting us know about any problems that came up. We also appreciate that you had a wonderful stay! Come back and see us! Nice condo! Beautiful view of Bay and Gulf Breeze. Good price! Will stay here again! Hated to leave. Thank you for your review. We appreciate the feedback and would be happy for your return to our condo. We hope to see you again next summer! It was great. We enjoyed our stay. Loved the location. We will definitely use vrbo again and would love the condo we just stayed in. It was great. Hi Kristina! Thank you for the review! We work hard to ensure our guests have a smooth booking process and love to hear when our work pays off!